How many of you enjoy cleaning the house? Bathroom sinks, showers, toilets … washing dishes? If you enjoy these things, congratulations, you are nearly one-of-a-kind! Now, imagine that Pig Lube smell, CLP, Rem oil … ahhhhhh the alluring aroma of gun solvents and dirty, oil-soaked, old T-shirts. Now that's some cleaning most of us don’t mind. Cleaning our firearms can be a relaxing task that allows us to again restore our favorite toys to a pristine, shiny, lustrous condition. Outside of providing stress relief, there are some important reasons you should be cleaning your firearms. A former student who attended my Concealed Carry Weapons class a while back contacted me. He had just bought a used pistol and found that it was not functioning correctly. He said sometimes the slide would not go forward into full battery. He was unsure what was causing it. We spoke a little, and after some time, he told me that he completely took the firearm apart, meticulously cleaned it, and then reassembled it. Low and behold, the firearm functioned just fine. The student told me that he noticed the firearm needed cleaning, but was shocked to find that the malfunction was caused by the firearm being so dirty. This was an eye-opening experience for the student. He learned that firearms don't necessarily have to be covered in rust, mud or sand, to be dirty enough to cause a malfunction. We decided during that talk, that I should address this in an article. So, here we are. Now, yes it is true that I spent a fair amount of my life in the Marine Corps infantry, which means I also spent a great deal of time cleaning firearms. I am not suggesting that you clean your firearms to a condition that would cause Chesty Puller to crack an approving grin from beyond the grave. I am however, going to explain why cleaning and maintaining your firearms will save your life. How often should you clean your firearms? That depends on use. Cleaning your firearms after every time you shoot is probably impractical for most of us. I would recommend cleaning your firearm after a certain number of rounds. Some firearms are better at functioning dirty and some ammunition leaves more debris, making your gun dirtier than others. A safe, happy median would be to clean your firearm every 250 or so rounds. You can’t over clean your firearm, and if you desire to clean it every time you shoot it, you won’t be doing any harm. A dirty firearm can most certainly effect the way a firearm functions. A dirty magazine can cause failure to feed malfunctions. Failure to feed refers to the inability for a cartridge to enter the chamber. A dirty extractor can cause problems with casing extraction. 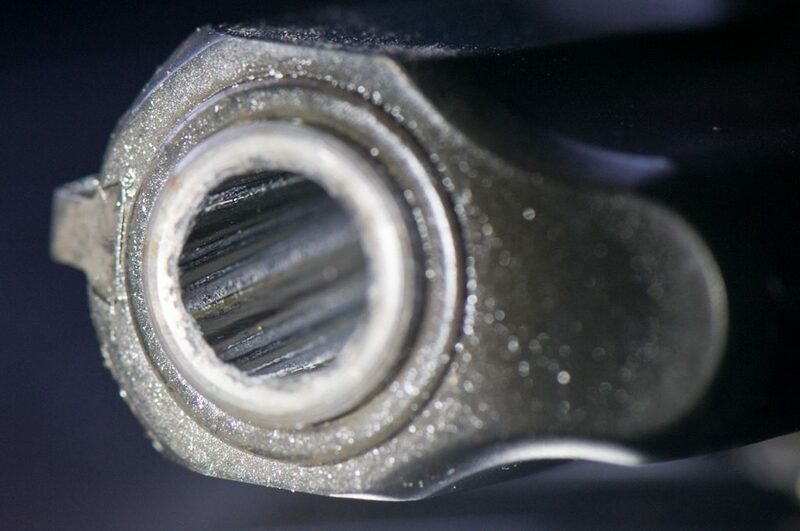 Improperly oiled internals can wreak havoc on trigger operation. If any of these things happen to you in a deadly force situation it could prove catastrophic. Additionally, rust can form on parts of your firearm from being in contact with perspiration. We all know rust and firearms don’t mix. When caring for your firearm, preventive maintenance is always easier than having to do a major cleaning. Let’s start by stating the important, but obvious. When you clean your firearm, you should do it in a well-lit and ventilated area, away from open flames. You should also remove any ammunition that may be present. Make sure the firearm is unloaded before disassembly. You’re going to want some old T-shirts, some q-tips, that old toothbrush that you needed to replace (you get a new one every dental visit anyway) and your cleaning kit consisting of patches, bore/chamber brush, punch rods cleaning solvent and lubricant. You may also choose to use one of those nifty bore snakes, which I find work well. After all that, put on some of your favorite music and start your relaxation therapy. If you are unsure of the process, make sure to reference your owners manual when you disassemble your firearm. If you don’t have an owner’s manual, there are some great tutorials on YouTube these days. Then again, there are also some horrible tutorials on YouTube, so make sure you evaluate the source of your information. Another option is to visit the manufacturer’s web page itself. Often, you can download the owner’s manual directly from the website. Not only does the owners manual contain assembly and disassembly instructions, it often provides information on which points to apply oil. Please remember that when applying oil to your firearm, don’t over do it. If one drop of oil is sufficient, 50 drops are not 50 times better. Applying oil to areas not requiring oil, or applying too much oil is detrimental to the function of your firearm. It attracts debris such as sand, dust, dirt lint, powder, etc. This can create a dirty, sludge-like build up that could cause a malfunction. Guns run well with light oil in key spots designated in your owner’s manual. Without this instruction, key points such as the rails in a semi-automatic and a light coat on the outside of the barrel are all that is really needed. Read More: I did a test on 7 different lubricating products to see which was best. In absence of specific points named by the manufacturer (usually involving removal of the grips and lightly oiling the internals), most revolvers only need to be cleaned well and wiped down with a lightly oiled cloth. There are many cleaning products on the market that promise outstanding results. Ask around and find what people seem to like, and it may work for you. There are some cleaning products that are not solvent based. These are a good option if you do not like the caustic properties or strong odor of solvents. They also have the benefit of not drying out your hands or potentially damaging plastic parts or accessories. Whatever product you choose, there are key points you want to clean. In a semi-automatic pistol, these are the feed ramp, chamber, slide rails, trigger group area, and magazine well. For most areas, scrubbing is not necessary. Carbon and buildup tends to form on the feed ramp and chamber area, so if it’s been a while since these areas were cleaned, it may need a good scrubbing. If your toothbrush isn’t enough to remove some stubborn carbon build up in these areas, a brass wire brush can be used. Make sure to clean your magazine well. This area needs to be clear of any debris to allow the magazine to slide in and out properly. While you're at it, clean your magazines, too, especially if you've been running any reloading drills and your mags have spent some time being dropped on the ground. Remove the base plate and clean the inside. Clean the follower and put it all back together. Do not put oil inside your magazines. This will surely attract debris and adversely effect the function of your magazines. For revolvers, the cleaning task is easy. For revolvers, the cleaning task is easy. The chamber, cylinder, and barrel all need a good cleaning. When cleaning the barrel of any firearm, it is preferable to clean in the same direction the bullet travels. This is mainly because the area at the very end of the barrel, the crown or muzzle, could be damaged if you are using a metal cleaning rod inserted from the muzzle end. If you are using plastic cleaning rods or using a bore snake it really is not going to matter which direction you clean your barrel. In some cases like with some snub-nosed revolvers, it is nearly impossibly to clean it without going from the muzzle side. Cleaning your barrel is simple and satisfying. First clean with your cleaning agent, and a barrel brush made for your caliber. After passing the brush several times, pass a cleaning rod with a patch attached through your barrel. A patch is simply a small, clean, cotton cloth. Pass the patches through your barrel until they come out clean. Look down your barrel in the light and observe the lands and groves happily shining away. 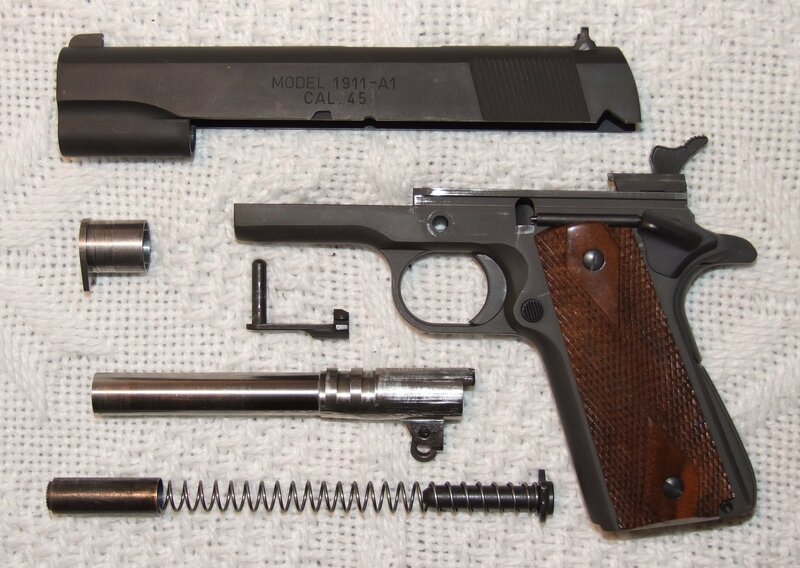 After cleaning your firearm, it is important to put it back together the proper way and function check it. Cycle your slide (semiautomatic) and pull your trigger. Ensure the firearm is functioning i.e. hammer falling, striker releasing and resetting, etc. If you have dummy rounds/snap caps you can load them into your firearm and ensure the firearm is feeding, extracting, and ejecting correctly. Lastly, put a few drops of oil on a cloth and wipe the firearm down. Do not put too much oil on your firearm or it will be slippery and difficult to handle. You don’t want to have to handle an oily, slippery weapon, or have it in your expensive, new leather holster. Have fun cleaning your firearm. Inspect it, look for areas that may appear to be wearing improperly. It’s better to catch a potential problem with your firearm while you are cleaning it, rather than when your life depends on it. Observe how the parts function. All this time spent manipulating and cleaning your firearm will give you the added confidence and understanding of how your firearm functions. How often do you clean your firearms? Let us know in the comments below. This is an awesome article! We learned some of this in our Conceal & Carry Class but you added way more information and I wanted to THANK YOU! Thanks also to my hubby for forwarding it to me. As an old nurse but new CC carrier this is great and OCD makes me meticulous about all cleaning. Stephanie, Thank you and your husband for reading the article. I am so happy you gained some good info from it. Unfortunately there is only so much time in most classes to devote to maintenance, and truthfully it isn’t the most exciting topics, but never the less, a very important topic. Thank you again, you and your husband stay safe. Kudos for taking on the extra responsibility of personal protection! You usually seem pretty quiet and well mannered on the podcasts, who knew you had such an impressive curriculum vitae. Wow! I’m impressed. I am 77and my hands are riddled with arthritis. I have a tough time with disassembling my weapons. Do you have knowledge of special tools or techniques that would help? Right now a friend cleans for me but I would really like to do it myself. Awesome article! Always clean your firearm !